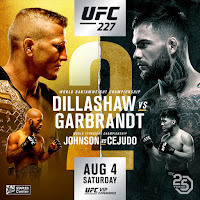 UFC 227: T.J. Dillashaw vs Cody Garbrandt Fight Pick & Preview | MMA Fighting Events Videos Techniques UFC Fight Picks and News. UFC PPV's this year started slow, but UFC 226 started to really heat things up and UFC 227 is carrying on the torch with another great main event! T.J Dillashaw vs Cody Garbrandt will be a rematch. Dillashaw one the first fight but definitely got lucky and saved by the bell. He knocked out Garbrandt in the second round. This rematch is Dillashaw's shot at showing that luck had very little to play in his big W and will be a shot at redemption for Garbrandt. Let's take a closer look at these fighters and then I'll make the official Chingasos MMA fight pick. We've picked the winner 15 times in the last 19 UFC PPV's! T.J. Dillashaw's MMA record is 15-3 overall. He's riding a 3 fight winning streak including his last fight where he got the TKO victor over Garbrandt and picked up the 135 lbs UFC title. For a smaller fighter, Dillashaw can finish fights, 7 of his 15 victories have come via KO/TKO and another 3 via submission. He's always been a well rounded MMA fighter but his striking game has evolved and gotten sharper every fight. Cody Garbrandt's MMA record is 11-1. The only smudge on his record is that loss to Dillashaw. Keep in mind, he almost finished Dillashaw in the first round. The bell was Dillashaw's savior and it's why many people in the MMA community feel it was a lucky win for Dillashaw. Cody Garbrandt, like Dillashaw can finish fights! As a matter of fact, Garbrandt actually has more KO/TKO's even though he has less fights. Garbrandt has finished 9 of his 11 wins via KO/TKO. If you like chingasos, this is the fight you don't want to miss! Even though these guys are in the 135 lbs divisions, both of these guys can throw bones with power and technique. This is one of those fights you want to invite a casual fight fan to watch because the chances of it being entertaining are extremely high! 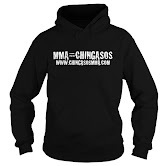 So what's the Chingasos MMA pick? Well, this is definitely a tough one. Dillashaw seems to have a few more stand up striking tools and technique, but Garbrandt has great boxing and power! I see Garbrandt being more aggressive in this fight. He admitted to losing focus and probably having and adrenaline dump in their first match up. That won't happen this time. Look for Garbrandt to land the harder shots and eventually KO/TKO Dillashaw!